Running an online store comes with a few hidden difficulties that are often linked to shipping. One of them being FedEx shipping rates, which is if you are particular with FedEx and no other carrier. It’s really important you understand the ins and outs of FedEx shipping estimate structure to avoid critical damage. As many of you may know, rates are calculated on the basis of your package’s weight and dimensions, shipping location, and many other possible factors. But there are other areas as well where you could spend money with no knowledge. So tracking your money flow and planning future deliveries requires you to be vigilant. 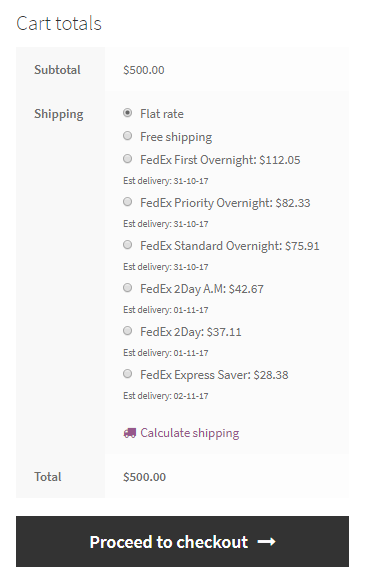 This article has been created with the motive of making you understand how the various FedEx shipping rates are displayed on your WooCommerce or Shopify stores. We will tell you how you can make the most out of WooCommerce FedEx Shipping plugin or Shopify FedEx App (for Shopify users). Imagine your store deals with both domestic and international customers. You wish to deliver your products using FedEx shipping services. Now, on one particular day, a customer from Scotland wants to purchase one of your products. He wants the cheapest FedEx International shipping service. With WooCommerce FedEx shipping plugin, you can offer him FedEx International Economy, which is the cheapest international service. Similarly, if you have another customer requesting to use the domestic FedEx Standard Overnight service, you can select it as well. To put it simply, this plugin will help you deliver your products to your customers irrespective of their location. This means that the plugin is capable of displaying shipping rates for countries and locations where FedEx operates. You would find the following shipping services in the WooCommerce FedEx shipping plugin. Have a look. To enable these services and calculate the corresponding FedEx shipping estimate, you must activate the Realtime Rates in the FedEx settings page. 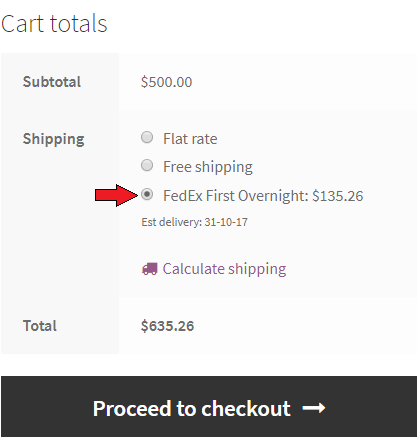 Enabling this option will allow the plugin to calculate the FedEx shipping rates and display the cost on your Cart page. And the best thing about this feature is that it does everything in real-time. For example, if your customer updates the cart by increasing the quantity of your item, the cart will quickly refresh and update the shipping cost based on the quantity. You can also select a particular country that you would want to ship your products to. This can be done by activating the Method Available to option which is a drop-down menu as shown in the given image above. Now, to choose the shipping method that you want to offer your customers, you can click on the tick buttons for the respective service. Doing this enables the various shipping options in the shopping cart. You can refer to the screenshot below. On the top left side of the image given above, you can see two arrows pointing opposite to each other. This option lets you drag the shipping service either up or down. This feature helps the store owners to give the service preference to their customers. Using this plugin, you can even adjust the price and the percentage of a particular service as well. Let us see an example to understand this feature in a better way. Imagine a customer is going to purchase an item from your WooCommerce store and it costs $500. If you haven’t given any value in either of the adjustments, then the FedEx First Overnight service will cost the customer about $112.05. Now, let’s say you want to increase this amount and want to add $12 to the ($)Price adjustment, then the corresponding shipping charges would come to be $124.05(112.05 + 12). And when you only add value to the (%)Price adjustment and enter a value, say 10, then the total shipping charges would come up to $123.26 (10% of 112.05 + 112.05). If you add 12 and 10 to both the ($) and (%)Price adjustment respectively, then the total comes up to $135.26. In the above image, you can see the final price($135.26) after adding values to both the adjustments. It is really important to make sure that your customers do not face any problem while choosing the shipping option. If you offer the shipping rates that are either too costly or are simply not convenient for them, then it might drive them away. Thus, it becomes very crucial to make sure that the shipping options are favorable to them as well. 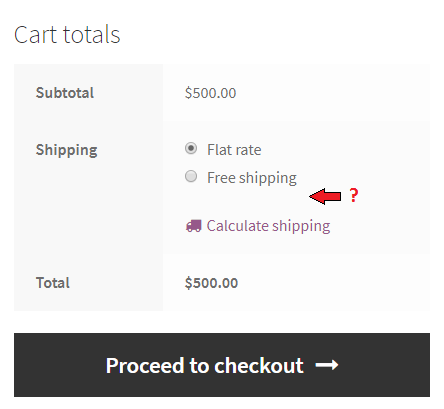 One more thing to notice is that even if you offer all the shipping services, they might be able to see only a few of the service on the WooCommerce checkout page. This usually happens because of the location of the customer’s address is not serviceable using some FedEx shipping services. To put it simply, these locations simply do not qualify for the particular FedEx service. Here is an example of a screenshot of the checkout cart. It is important to note that if your customers make some mistake while filling out the address form, then the plugin might throw some errors. One of the most common errors is the invalid country or state code. You can check out the following example that shows the error. Imagine a customer enter the Pincode as 90001, which is from the California state. But somehow, he or she chooses the wrong state in the state drop-down menu, something like shown in the image below. 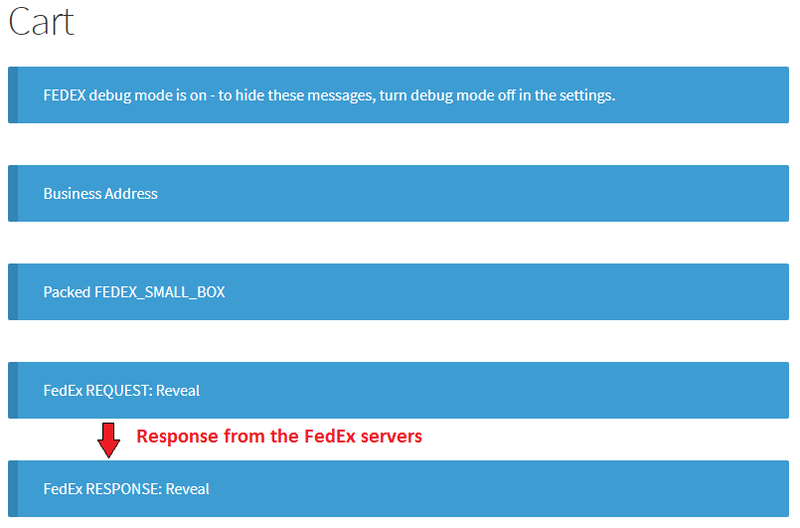 In order to know this issue, you can enable the Debug mode in the FedEx settings page. 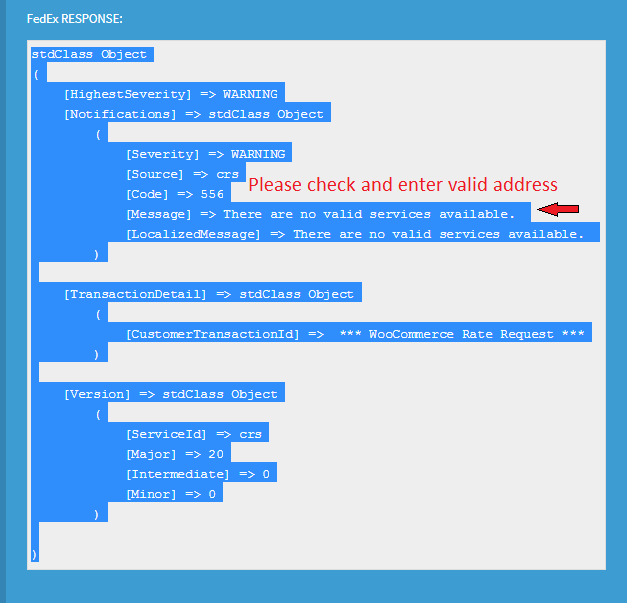 This feature can help your store owners to find the error response from the FedEx servers and change the given address with the correct one. This feature, when enabled, will show some dialog boxes on the checkout page as soon as the customer enters the page. The error dialog boxes may appear something like the image given below. Doing this can help you to check whether your complete checkout process is working fine or not. These steps are crucial while setting up your online store as it will also give you the real-time efficiency of your checkout page. Using the WooCommerce FedEx Shipping Plugin, you have the option to offer your customers the cheapest shipping rate among other shipping services. For example, if you’re offering the following FedEx shipping services and you want to offer only the cheapest, i.e, the FedEx Express Saver, then you can go for this option. The result of this step would result in the following image. You may go for this solution if it inlines with your business strategy. Let’s consider a simple business case. Suppose the demand for a particular product is high during the holiday season. As a result, you have to offer all the shipping options to cover more ground and make more sales. This might be because of the fact that the customer would want to get their orders as soon as possible, and they go for faster deliveries methods. These deliveries are usually costlier than other normal-paced deliveries. But if the product’s demand during the usual season is comparatively lower than the holiday season, then you might consider going for the cheaper rate option. It will help you keep that product’s flow going. The Shopify FedEx App offers almost all the FedEx services along with many amazing features. Users who would like to add in live shipping rates, order tracking, FedEx freight shipping services, FedEx pickup, etc., can choose this App. 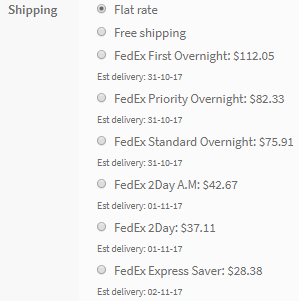 It displays the shipping rates on the Checkout page. Whenever a new customer places an order on your store, he or she will receive a confirmation email instantly. Here’s how the Checkout page looks with the FedEx services in it. You can know more about how the FedEx shipping rates are displayed using Shopify FedEx App. And it’s really simple to set it up on your online store as well. FedEx and its services are quite popular among global customers. If you compare FedEx and UPS, you’d probably find FedEx’s rates to be a tad cheaper than UPS in certain locations. So going with FedEx and its services would be a profitable choice. WooCommerce FedEx shipping plugin is an amazing tool to fetch live FedEx shipping rates. And so is the Shopify FedEx App for Shopify users. You could use any of these tools based on your e-commerce platform, which is, either WooCommerce or Shopify. We hope this article would have helped you understand the basic working of the shipping rate calculation. Let us know in the comment section about your thoughts on this. If you have any query regarding this article or need help setting up FedEx shipping on your store then feel free to contact us.